The Hyde Park campus of the Culinary Institute of America is located in the town of Hyde Park, New York, between the Hudson River and U.S. Route 9. The Culinary Institute of America (CIA) campus offers associate and bachelor's degrees and certificate programs in culinary arts and baking and pastry arts. It is the school's primary and largest campus, with about 2,300 students. The property was first settled around the 1600s, and mills and farms made use of the area's land and streams until the provincial of the Maryland-New York Province of the Society of Jesus purchased the land around 1897. The Jesuits subsequently constructed the present-day Roth Hall and other buildings, operating the property as the novitiate St. Andrew-on-Hudson from 1903 to 1970. In 1970, the Culinary Institute of America purchased the property and moved its school there from New Haven, Connecticut. The school operates the property as its primary campus. The river was an abundant source for fish, edible plants, and water, and the Albany Post Road (present-day US Route 9) is one of the Hudson Valley's oldest north-south routes. In 1697 the land along the kill was part of Water Lot 3 of Dutchess County's Nine Partner Patent. The earliest use of the site by colonists is estimated to have been around the 1750s. The saw mill, according to the study, was present in 1774. The grist mill was owned by Jeremiah Rogers, a militia officer serving on Long Island during the Revolution. The family burial ground, across the kill, has the graves of Rogers, his son and daughter, and his grandson. :1:8 The property changed ownership multiple times in the 1800s. James Roosevelt owned the land as part of his estate in the 1820s, and by the 1860s a farmhouse and stone terraces were constructed along the stream by Moses Beach. In the 1890s the Webendorfer family of Long Island refurbished the farmhouse and built barns, a tenant house, and other structures. From 1919 until its destruction around 1940, St. Andrew-on-Hudson used the Webendorfer house as a rest home. A one-year archaeological survey was performed at the school in 2003. The survey found evidence of human activity in the campus' wooded property dating at least 3,600 years, with elements dating from around 1700 BCE and up until the mid-20th century. The survey was a requirement of New York's State Historic Preservation Office in order for the school to construct a new residential complex in a 36-acre (15 ha) expansion to its campus; it was funded by the CIA and conducted by Landmark Archaeology, a company based in Altamont, New York. The surveyors focused on a 5-acre (2.0 ha) site between the Hudson River and Route 9. The site contained two house structures, a dam, a mill, retaining walls, and outbuildings and barns, and was found to be eligible as a historic district on the National Register of Historic Places. Excavations unearthed foundation walls, a well, cistern, and post molds, and about 40,000 artifacts. Prehistoric objects, dating to the Late Archaic period, included stone tools, byproducts of tool production, projectile points, and fire hearths found in the site's portion used for crop cultivation. A larger area held artifacts from the mid-to-late 1700s, including ceramics, tobacco pipes, coins, buttons, buckles, military objects, thimbles, domesticated animal remains, and an inscribed piece of slate. Due to the findings, the CIA revised its plans to prevent construction on a large portion of the site. 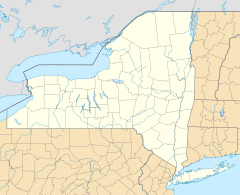 The novitiate was moved to the Jesuit provincialate at Le Moyne College in Syracuse in 1968 and St. Andrew-on-Hudson was closed. The Syracuse provincialate was renamed St. Andrew Hall. Farquharson Hall, the main dining hall used for commencement and other ceremonies, was renamed in ceremony thanking John and Clara Farquharson in November 2002. The chapel, built in 1906 and dedicated November 1907:5:6 as St. Andrew's main chapel, has vaulted ceilings, stained glass windows, and murals, and seats 330. John Farquharson was a member of the school's board of trustees and was involved in food service, including at Aramark and the International Food Safety Council. Farquharson noticed the hall needed repair and donated $1.4 million to restore the building. John Canning Studios designed a 5-month restoration, which took place from May to September 2002, and restored lighting, carpets, ventilation, and audio systems. The Farquharson family crest was painted on the back wall of the room, along with portraits of Angell and Roth, and a skyscape mural on the ceiling. The hall's reopening ceremony involved a ribbon-cutting and lunch with the Amerscot Highland Pipe Band playing bagpipes. In 2013, the school built its Marriott Pavilion Theater and Conference Center, which cost $19 million, $5 million of which was from the J. Willard and Alice S. Marriott Foundation. The Marriott Pavilion is now the location for the school's graduation ceremonies. The Half Moon Theatre Company, a Broadway-style group formed in 2006, has operated out of the pavilion's theater since 2014. The 70-acre (28 ha) campus is about three miles north of the city of Poughkeepsie:7:1 and 80 miles north of New York City. It is located on the Hudson River, at a point where the river is about one-half mile (0.80 km) wide. The property has steep and varied banks against the river's edge. :2:3 The average temperatures include a low of 11 °F (−12 °C) in January and a 79 °F (26 °C) average high in September; there are about 119 days of precipitation per year. The school's Campus Safety department protects the campus. The department is on campus and on call 24 hours a day, seven days a week. Their duties include, but are not limited to: patrolling the college around the clock, responding to emergency situations as well as non-emergency calls for service, crime prevention services, active investigation of crimes on campus, enforcement of state criminal and motor vehicle laws, and campus regulations. The department's offices are located in the Campus Safety Building, a red diner building behind Roth Hall. The diner was constructed by Mountain View Diners Company in New Jersey and purchased by the CIA in 1971. The school transported, refurbished, and attached it to a preexisting building, an outbuilding of the Jesuit seminary. The diner, referred to as the school's "coffee shop", originally served as a fast food restaurant for students; the CIA president and vice president had desired some fast food training in the curriculum, as the style was very prevalent at the time. The Walgreen Company, which operated similar restaurants at that time, donated $25,000 to the school for the diner restaurant. In 1978, the Wechler Corporation donated an additional $20,000 donation, and the facility became known as the Wechler Coffee Shop. The Hyde Park campus operates four public restaurants for students to gain experience in kitchen and management skills. Food served at the American Bounty Restaurant highlights Hudson Valley produce and is prepared in the style of cuisines of the Americas. The Bocuse Restaurant serves traditional French food using modern techniques. It was the first of the school's restaurants, and opened as the Epicurean Room and Rabalais Grill in 1973, before being renamed the Escoffier Restaurant (after Auguste Escoffier) in 1974. In 2012 it was again renamed to honor Paul Bocuse, and given a $3 million renovation by Adam Tihany. The Ristorante Caterina de' Medici is a restaurant with a focus on authentic Italian food. The Apple Pie Bakery Café has a casual atmosphere and serves sandwiches, soups, and baked foods. The school also frequently creates on-campus pop-up restaurants, including Post Road Brew House. The second of the campus' pop-ups, the gastropub will open in February 2016 in the General Foods Nutrition Center (formerly St. Andrew's Cafe). The student-run Ristorante Caterina de' Medici was moved to a new location in May 2001, when the Colavita Center for Italian Food and Wine was built for $6.7 million. Roberto Magin, a Florentine architect, designed the building. The Bocuse Restaurant serves contemporary French food. It opened on May 5, 2012 after a $3 million renovation designed by Adam Tihany. Originally the Epicurian Room, and renamed the Escoffier Restaurant in 1974, the restaurant originally served classical French cuisine in an old-fashioned formal French dining room. It had French chandeliers, gilded mirrors, patterned carpets, and high-backed chairs. The redesign intended it to now resemble a brasserie, with polished steel lights, smoked-oak floors, and bentwood armchairs. The new restaurant would also do away with traditional kitchen stations and hierarchy previously common in the restaurant industry, and would double the size of the restaurant kitchen. A new station was included to sous vide food. Another modernization is to have seasonal ingredients dictate the menu, as opposed to the previous restaurant's dishes dictating the ingredients purchased. CIA graduates who worked in the Escoffier Restaurant included Grant Achatz, Jonathan Benno, Anthony Bourdain, David Burke, Harold Dieterle, Todd English, Susan Feniger, Larry Forgione, Johnny Iuzzini, and Bradley Ogden. The campus offers intercollegiate, intramural, and club athletics, playing under the name "Steels". Its intercollegiate program began in 2004, and is affiliated with the Hudson Valley Intercollegiate Athletic Conference. 11% of the student body participates in the school's intramural sports, and 3% in its intercollegiate sports. These include men's and women's basketball, cross-country, soccer, and tennis, and women's volleyball. The school also has about 27 student organizations, including three religious groups, one honor society, and one LGBT group. It does not offer any Greek life organizations. The campus' student newspaper, La Papillote, was established in 1979. The newspaper's primary mission is to report school news and current events in the food industry. The paper is published by the school's Student Affairs Division, and usually has three student editors, including the editor-in-chief and two copy editors. The paper uses submissions from students, chefs, and outside professionals. The paper succeeds about eighteen other student newspapers at the school, dating back to its opening in 1946. In May 2008, La Papillote was prevented from reporting on a dispute against the school's president, who later apologized and allowed a full report in the paper's next issue. The president L. Timothy Ryan held that he was trying to prevent students from being involved in a conflict between the faculty and administration. As part of a Stormwater Pollution Prevention Plan, the CIA built a garden on top of the student commons building during its renovation. The garden takes in water, leading less rainwater to wash trash into the Hudson. The school's 12-member grounds staff maintains the garden, growing berries which are used in the school's classes and restaurants. The first dining hall at the CIA was built in 1906 as a chapel; the Jesuits had constructed it as their main chapel to replace smaller chapels in the building. The Jesuits built smaller chapels including altars at each alcove of the hall, and had a pipe organ in front of the main altar off to the left. Upon the CIA's purchase, the chapel was converted into a dining hall, known as Alumni Hall. In 2002, the dining hall was renovated and renamed Farquharson Hall. In June 2015, the school opened the Egg, a 550-seat dining hall on the Hudson River. The dining hall also serves as a kitchen classroom, where students prepare food for the areas known as the Innovation Kitchen, the Line, and the Brooklyn Brewery. The Brooklyn Brewery was established with New York City company Brooklyn Brewery, which sponsored the on-campus brewery and trained staff. The brewery has a full-time brewer, assisted by bachelor's students in the beverage concentration. The Innovation Kitchen is staffed by students in the intrapreneurship concentration. The students break into groups and create a business plan, including marketing, menus, and a human resources manual. The Line is operated by students and has a cycling menu which changes every three weeks and seasonally. The Egg also has a separate cooking suite, the Café, which serves hot foods, coffee, and sushi. The dining hall has an open plan and a variety of decor, including lounge areas, dining tables, a retail food and beverage market, large television screens, a stage for entertainment and cooking demonstrations, and outdoor patios. The hall also has a private dining room and a lounge area with a fireplace and library. The dining hall is named after eggs as used for cooking, and it features a large metal sculpture of an egg at its entrance. ^ a b c d e f g h i j k l m n o p q r St. Andrew-on-Hudson novices (1953). History of St. Andrew-on-Hudson. Poughkeepsie, New York: St. Andrew-on-Hudson – via CIA Archives and Special Collections. ^ a b c d Landmark Archaeology, Inc. (Spring–Summer 2005). "Life along the Maritje Kill". The New York State Preservationist. New York State Historic Preservation Office. pp. 22–23. Retrieved May 20, 2017. ^ "Projects: Culinary Institute of America Dormitory Project". Landmark Archaeology, Inc. Retrieved March 8, 2017. ^ a b c d e f g h i j k l m n o p q Bender, Arthur C. (2014). A Brief History of the New York Province (PDF). New York Province of the Society of Jesus. pp. 18–19. Retrieved 19 November 2016. ^ Greenberg, Jan (October 20, 2010). "Secrets of the CIA". Hudson Valley Magazine. ^ Levine, Jeff (April 9, 2015). "Renowned Jesuit Philosopher Pierre Teilhard de Chardin, Who Died 60 Years Ago, is Buried at the CIA". Culinary Institute of America. Retrieved 19 November 2016. ^ a b Karchmer, Jennifer McGraw; Ferris, Lee (November 23, 2002). "Restored banquet hall debuts". The Poughkeepsie Journal. Poughkeepsie, New York. p. 4B. Retrieved March 18, 2017. ^ Stewart, Emily (September 18, 2013). "Culinary Institute transforms itself as new pavilion takes shape". The Poughkeepsie Journal. Poughkeepsie, New York. Retrieved March 19, 2017. ^ Lubitz, Sarah (November 6, 2015). "Half Moon Theatre Company at the CIA". La Papillote. 36 (14). The Culinary Institute of America. Retrieved June 19, 2017. ^ a b "College Profile: Culinary Institute of America". CollegeData. Retrieved May 31, 2017. ^ a b c "Culinary Institute of America". College Board. Retrieved May 31, 2017. ^ "Schedule J: Form 990" (PDF). Nonprofit Explorer; Internal Revenue Service. 2014. p. 3. Retrieved November 10, 2017. ^ a b "2015 Annual Security, Fire Safety, and Statistics Report" (PDF). The Culinary Institute of America. September 2016. Retrieved May 18, 2017. ^ "Once, Twice,...Three Times a Coffee Shop". La Papillote. 5 (3). The Culinary Institute of America. April 16, 1982. ^ Collins, Glenn (July 2, 2012). "Culinary School's Dining Room to Get Fresh Air". The New York Times. Retrieved April 17, 2016. ^ "New York Campus Restaurants". The Culinary Institute of America. Retrieved April 2, 2016. ^ Sprong, Alison (January 20, 2017). "Post Road Pop-Up". La Papillote. The Culinary Institute of America. ^ Boss, Donna (February 2002). "Ristorante Caterina de' Medici at the Culinary Institute of America". Foodservice Equipment & Supplies. pp. 41–44. Retrieved March 19, 2017. ^ a b c Collins, Glenn (July 2, 2012). "Culinary School's Dining Room to Get Fresh Air". The New York Times. Retrieved March 19, 2017. ^ "CIA Athletics". The Culinary Institute of America. Retrieved April 2, 2016. ^ "The Culinary Institute of America". The Princeton Review. Retrieved May 31, 2017. ^ "Compact". La Papillote. 38 (1). The Culinary Institute of America. January 20, 2017. p. 2. Retrieved March 14, 2017. ^ "Archives and Special Collections: College Archives". The Culinary Institute of America Archives and Special Collections. March 13, 2017. Retrieved March 14, 2017. ^ Severson, Kim (May 7, 2008). "A Culinary School's Changes Are Met With Unrest". Retrieved March 9, 2017. ^ CIA Self-Study. The Culinary Institute of America. April 2001 – via CIA Archives and Special Collections. ^ "A Secret Garden". La Papillote. 36 (14). The Culinary Institute of America. November 6, 2015. p. 3. Retrieved May 23, 2017. ^ a b Wong, Benita; Cleary, David (March 14, 1977). "House of the Holy". Toque Blanche. 1 (12). The Culinary Institute of America. pp. 5, 10. Retrieved May 12, 2017. ^ Cleary, David (May 16, 1977). "House of the Holy". Toque Blanche. 1 (15). The Culinary Institute of America. pp. 9–10. Retrieved May 12, 2017. ^ Higgins, Sage (April 20, 2017). "College Dining on a Dime: The Egg". The New Paltz Oracle. Retrieved May 12, 2017. ^ a b Friedlander, Jessica (2015). "Culinary Institute of America Hatches A Student Facility, The Egg". Westchester Magazine. Retrieved May 12, 2017. Wikimedia Commons has media related to The Culinary Institute of America, Hyde Park.